HomeWhat’s going on with Vodafone’s 2.5GHz spectrum? Woosh and Kordia were successful bidders in the 2.3GHz band, and a 25MHz reservation at the top of the band was made by the Crown for the Maori spectrum trust, who are allied with and a shareholder in 2Degrees Mobile. In 2010, Woosh and Kordia joined forces to bid for the government’s Rural Broadband Initiative, with their 2.3GHz holdings and a TD-LTE (band 40) network at the centre of their plans. That bid having failed, the spectrum of both parties has gone unused. The 2.5-2.6GHz band has seen a little more activity than 2.3GHz, but not by much. Transit NZ and a few regional players have installed WiMAX systems in the Managed Park spectrum, and Blue Reach deployed a WiMAX network in Auckland that saw use back hauling Wi-Fi hotspots during the Rugby World Cup. The real potential for 2.5-2.6GHz lies in its use for Long Term Evolution (LTE) cellular systems. 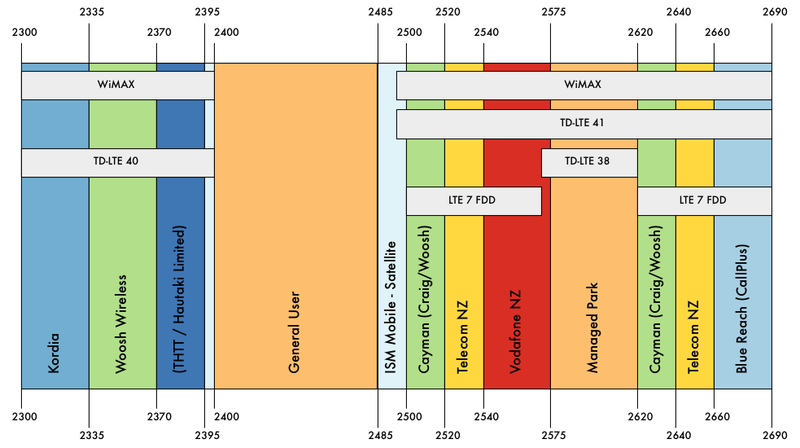 Craig Wireless (now a shareholder in Woosh) and Telecom NZ came away from the auction with some great spectrum, each winning a 20MHz pair of spectrum in LTE band 7. This band is special as it’s harmonized with Europe, allowing easy roaming, and already has 94 GSA certified devices – more than any LTE band except US 700MHz (which isn’t compatible with New Zealand’s 700MHz). Just last week Telecom NZ announced an LTE trial. While they haven’t mentioned any technical details, if I were building it, I’d ask my technology partner for a dual-band FDD LTE configuration, using band 3 (1800MHz) and band 7 (2600MHz). Band 3 adds another 75 certified devices on top of the 94 available for band 7 – overall a great ecosystem to build a network for. An added bonus comes with LTE-Advanced releases, which allow carrier aggregation across bands. With 2Degrees Mobile in LTE band 40, Telecom in LTE band 7, and Woosh in both 40 & 7, Vodafone is a carrier apart. Their strategy for 2.5GHz must be either WiMAX or TD-LTE band 41. A year ago LTE band 41 wasn’t even a released 3GPP specification. This changed due to pressure from Clearwire, a wholesale wireless provider in the US who are partly owned by Sprint. Clearwire made a strategic decision to abandon a multi-city WiMAX network they built in the US to pursue a TD-LTE strategy. They recently committing to a 5,000 tower build in the next year. Unlike other bits of spectrum, LTE band 41 doesn’t have any end user devices available yet. This will soon be remedied, thanks to Qualcomm, who have announced they will be building band 41 support in to all of their new chipsets. Will Vodafone throw their lot in with Clearwire and Qualcomm, or they could be taking a tilt at a WiMAX deployment? Whichever option it is, they seem to be doing it now. The attached spectrum analysis plot, taken the evening of the 20th of May from Mt. 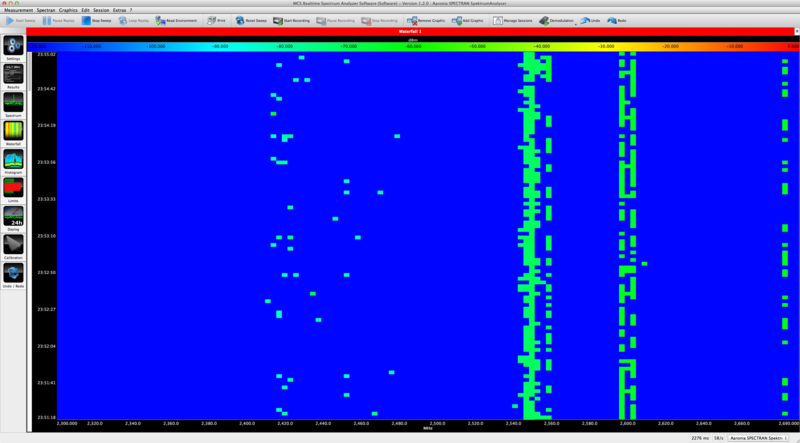 Victoria, Wellington, clearly shows Vodafone’s 2.5Ghz spectrum in active use. Do Vodafone have news for us?